UPDATE: 07/19/2005 We are leaving a bit earlier than previously planned. If you would like to meet up outside my place in Skokie at 6:00am, or meet us along the way down, send me an e-mail and let me know. (If you have already contacted me I will get info out to you soon). Sugestions to bring for spectating: FRS radio tuned to channel 1 subchannel 1 for the drive down, drinks, healthy snacks to stay hydrated and alert, sunscreen, bugspray, hat, foldup chair, Chicago MINI Motoring Clothes and a smile!! UPDATE: 07/13/2005 We only have a few people who are heading out to watch, so we will be heading out early to get to Autobahn at the same time as the drivers. We will most likely be leaving the north suburbs at around 6:30-ish. Please post here, or e-mail steve@chicagominiclub.com if you are interested in joining us!! 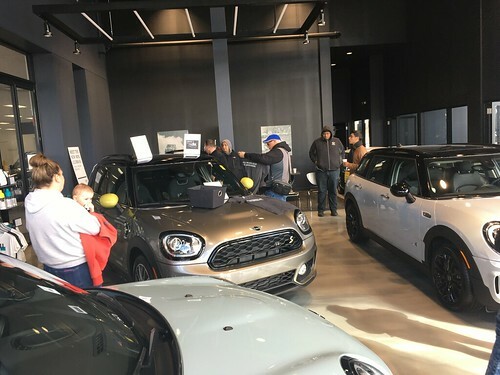 The Chicago MINI Motoring Club will be out Spectating at the Phil Wicks Driving Academy in Joliet on Sunday July 24th. There will be a $10 gate fee for spectators, and Phill has extended an invitation to MINI Club members to take a few touring laps of the South Track at controlled speeds (in a lead/follow situation) during the class lunch break. Details are still in the works, but we are planning a small group drive down to Joliet. Post here if you are interested in hanging out at a cool new track and cheering on our fellow MINI (and other brand) drivers!! sounds like fun. that might be when i am on vacation in wisc. but if it isn't you can count me in. Gabe, what are we going to do with you….it's a Driving School not a race. 🙂 You'll learn soon enough. Steve, look me up and I'll take you out for a ride. Guess it's time to get that passenger harness belt now. Anyone else concerned about using (and possibly ruining) their tires on the track? I use the all-season run-flats, and am concerned about how the expensive tires will hold up. Thoughts? Zack, if you ruin them and switch to non-run-flats you will be amazed as to how much the ride inproves. The run-flats have such a stiff sidewall that you feel every minor bump in the road. Now if you feel more secure with the run-flats, how much wear you will experience on the track is all dependent on how hard you push the tires and the inflation. If you bump them up a couple punds and don't push too hard the wear will be minimal. Since I took Phil's class in St Louis I guess theres not much point in repeating it. (If you haven't taken this class, what are you waiting for?) But the lead/follow thing during lunch sounds interesting. I don't want to take my old, normaly aspirated 02 out and play in traffic. Probably just get run by, by Gabe, Jim and the rest of you turbo people… But I'd love to follow around a few laps at a set limit. So Steve, pick a time and place to meet. Knauz is having their “Mini Road Tour” this same day, otherwise I'd probably spectate. Anyone in the club doing the Knauz event? Glad to hear others are torn for MINI events on the 24th! Spectating at the Autobahn sounds like a good way to find out more about the classes, and driving the track would be awesome! Helmits needed though? Does anyone have a good idea what the Knauz rally would involve? Maybe our 2 MINIs will have to split interests! Looking forward to seeing you MINIacs agian! I've gone to the Knauz rally every year and have to say that it is exhausting. Very long and all roads are straight. If I remember right the drive was put together by their marketing company. That should give you an idea. That figures, the Knauz drive is the same weekend. Oh weel, I haven't received an invite yet anyhow. Becky, for the “follow the leader” I'm not sure if Phil requires helmets or not. I know he normally has a few loaner helmets for rent if necessary. The Knauz drive is a nice event as they do have breakfast, snacks and a nice lunch provided. As Gabe indicated the drive is not real exciting, but motoring with a bunch of MINI's is always fun in itself. What Jim said for me as well. I attended the past 2 years Knauz drives, but didn't get an invite this year either (and just found out they were having the drive yesterday). I know of at least one other club member attending the Knauz drive.. I am already committed (and looking forward) to spectating at Joliet!! My son and I are both enrolled in the Performance Basic (Novice) class. Helmets are required for anyone enrolled in the driving classes according to the info packet I recieved from Phil Wicks. We are really looking forward to this! Never got even a whisper about the Knauz drive. Even saw David O. at the dealership when I had my MINI in for routine stuff before the warranty expired. I stopped by Knauz on Friday and spoke with Eric and told him I didn't get an invite this year and he gave me the surprised “we sent them all out” reply. Since that's now 3 first year buyers and former attendees of the drive I have to suspect they left us off the list to get new folks in. Just as well. Not the most exciting drive in my book. Geat comments!! For those interested, I called Phil Wicks Academy and he assured me that we don't need helmets (FOR S TRACK/ SPECTATORS) and we can have more than one in the car:^) The $10 per person gets you an armband for security and insurance on the course. Speed on the lap will be monitored for safety, so this will give us slightly intimidated a chance to give it a go :^) He recommended bringing a camera, but also said their would be a professional there for a group photo! Sounds fun! Hope the info helps! Now to decide which MINI goes where… Phils/Knauz..
My wife can't make the Knauz drive. I have an open seat if anyone would like to ride along with me.